This place is absolutely stunning in winter (November-February) and was the reason for my trip. Thousands of snow geese and sandhill cranes feed and rest up on the ponds there. I've seen much bigger flocks of snow geese in the Skagit Valley of Washington state, but Bosque del Apache presents a unique photo opportunity: You can photograph a flock of snow geese lifting off from a lake at sunrise. They do it every morning with nearly the regularity of a Las Vegas show. The reserve opens an hour before sunrise and you'll want to stake out your space at a viewpoint known as the Flight Deck within 15 minutes of it opening. The place is incredibly popular with photographers – and photo tours in particular. The days I were there, close to half of the photographers on the deck were part of one tour or another. Within 20-25 minutes of the park opening, there absolutely was no room for anyone else on the deck. There are some other vantage points along the road, but I don't think they are as good. They're claimed pretty early too. The other reason to go early: the birds are somewhat unpredictable. I spent three days there. 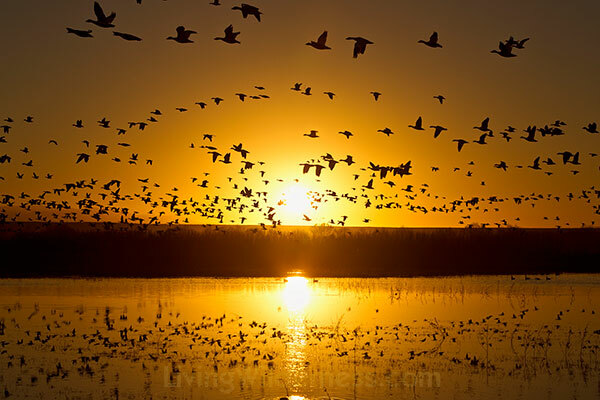 The first day they flew a few minutes before sunrise, the second day they flew about 10 minutes after sunrise, and the third day they flew about 20 minutes before sunrise. Go early to get your place. Dress warm – it was just 13 degrees Fahrenheit the mornings I was there. And keep your eyes open. Once the snow geese perform, head to the roadside ponds north of the visitor center, a couple of miles from the entrance gate. These ponds will be packed with sandhill cranes and you can photograph them taking off in the golden light. They don't take off all at once like snow geese, but you can get stunning images of small groups. From the distance, it looks like a ski resort. Up close, it looks like mounds of powdered sugar. White Sands National Monument is a very large reserve of white sand dunes. Also check the missile testing schedule. The park is next door to the White Sands Missile Testing Range. Whenever they're testing, the dunes are off limits. I have photographed a number of caves, but I was truly impressed with the formations in the Carlsbad Caverns. The main cavern is a few miles long and there was no shortage of things to photograph. Tripods are allowed in the natural entrance and the Big Room route and if you plan to do any serious photography, you should bring and use one. Those are also self-guided tours. Plan to go there early. The park service begins closing the cave mid-afternoon to get everyone out by 4:30. While you can use a flash, I rarely did. Many of the formations are lit with differently-colored lights for dramatic effect and your flash unit will just negate that. If you do plan to do take some close-ups, though, a flash unit will probably help. Cameras, but not tripods, are allowed in the ranger-guided King's Palace tour. This cavern got a lighting "upgrade" a few years ago, though I'm guessing it made things worse for photographers. This section of the cave is lit with energy-efficient LEDs. It's soft lighting that's pleasing on the eyes, but it also seems dimmer than the lighting in the main section. Even setting my camera to ISO 6400, I couldn't get a shutter speed fast enough for handheld photography. There are some benches that you can use to brace your camera, but photography in this section is incredibly difficult. It's worth doing the tour; it is the most stunning section of the cave that I visited. Just don't expect great photos. There's an amazing petroglyph site at Three Rivers, less than an hour north of White Sands. They've found thousands of different petroglyphs on rocks scattered throughout the park. A well-marked trail and brochure guide you some of the highlights, but this is a place you just want to look around. Shiprock in northwestern New Mexico is also worth a visit. This mountain, located on Navajo land, rises out of nowhere and is beautiful bathed in the golden light of sunrise. The Navajo name for the mountain translates into "rock with wings." According to their legend, a bird guided them from the North to the present-day Four Corners area. Check out the rock from different angles. From some angles, it looks like a bird with wings. From others, it looks like an old sailing schooner, which is why we call it Shiprock.